Stepping up pressure on the Centre for a nationwide ban on endosulfan pesticide, Kerala Chief Minister V S Achuthanandan on Monday began a day-long fast in Thiruvananthapuram along with peoples' representatives, political leaders and civil rights activists to press for the demand. The mass fast at the martyr's column is being held as part of the "anti-endosulfan day" being observed in the state on Monday. It began at 10 am and would end at 5 pm. The agitation comes on a day when discussion on the demand for ban on persistent organic pollutants begins at an international convention in Geneva. The protestors demand that India press for a ban on endosulfan at the Geneva convention. 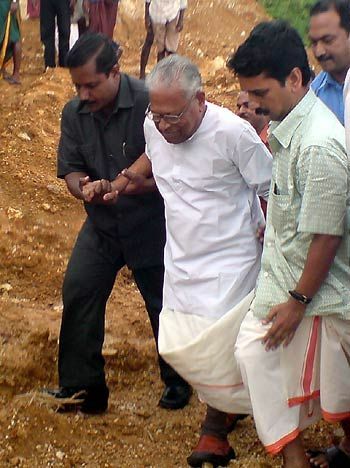 Speaking at the venue, Achuthanandan said the "negative approach" of the Centre and the Prime Minister towards the demand for endosulfan ban was a "challenge to the people" and would have to be corrected. Scientific studies by expert panels formed by the Centre and state had found that endosulfan was a deadly chemical. However, the Prime Minister had been "wrongly briefed" by his colleagues on the ill-effects of the pesticide, he said. "It was strange that the Centre adopted a stand that people in every state should be affected by the pesticide before considering a nationwide ban," the Chief Minister said, and wanted India to press for its ban at the Geneva convention. Ministers M A Baby, C Divakaran, M A Baby, poet and social activist Sugathakumari, CPI leader C K Chandrappan, LDF convenor Vaikom Viswan and BJP leader O Rajagopal are among those taking part in the fast in Thiruvananthapuram. Similar protests, led by ministers, are being held in all district headquarters in the state. 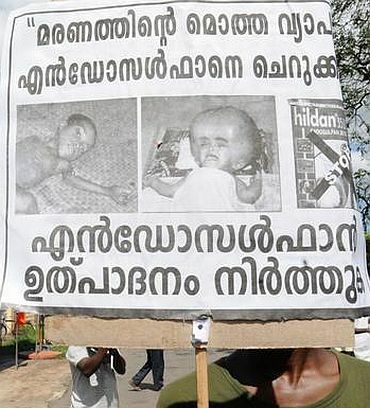 In Kasaragod, the worst-hit region by the use of endosulfan, a mass rally is being held against the protest. 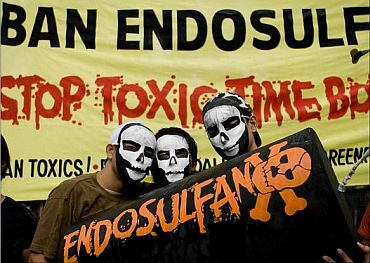 Endosulfan has been banned in Kerala since 2005 in view of the grievous ill-effects of its use in cashew plantations in Kasaragod, including nearly 500 deaths and chronic health problems among the population. The state has been pressing for a countrywide ban on the pesticide and wants the Centre to support the relief and rehabilitation package for endosulfan victims. An all-party team from Kerala had met Prime Minister Manmohan Singh in New Delhi last week to press the demand. While BJP is participating in the stir throughout the state, the Congress-led UDF is keeping away alleging that the Chief Minister and the Left Front was trying to politicise the issue.